After watching Sneakers and The Net last week I decided to add a few more movies to the top of my Netflix account including WarGames, which I had never seen before. I got it and watched it today and it’s a great little movie. 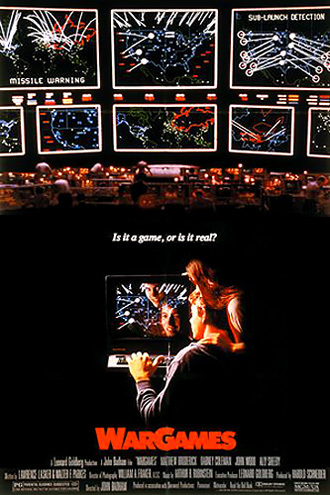 Matthew Broderick stars as a kid who accidentally hacks into NORAD’s system and plays their war games simulator which somehow makes the system think it’s happening for real. The government goes after Broderick to find out what he’s up to, but he escapes and finds the system’s creator who eventually shows up to help convince the government guys to listen to the kid. Ally Sheedy plays his love interest pre-Breakfast Club, Dabney Coleman plays a guy working for the government who runs the system, Michael Madsen has a brief role in the beginning as a guy with his hand on the proverbial button and the guy who played Eugene in Grease (Eddie Deezen) plays a super-annoying hacker friend of Broderick’s. Overall, the movie paces itself well and seems authentic enough. Unlike the 90s movies I watched, this stuff was all WAY before my time (it came out the year I was born) so I have no idea how accurate it was on the technology side of things, but the IMDb trivia said the screenwriters Lawrence Lasker and Walter F. Parkes (who also wrote Sneakers!) hung out with some hackers to get some of the tech specs right. Gotta love that level of commitment to the source material, but I’m guessing the hackers didn’t appreciate being portrayed by the super annoying kid from Grease. Man, I’m glad I never had to actually take my phone off the hook and put it on my modem to get it to work. Or if I almost accidentally created a global nuclear war just because I was really excited about playing a new video game. 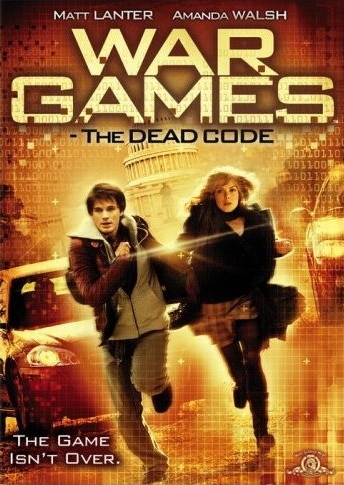 As you might expect, watching the original lead me directly to checking out the WarGames sequel Death Code which I liked much more than I expected to. When it comes to straight to DVD sequels to 80s movies, I think I’ve only ever seen Road House 2 and Lost Boys: The Tribe, one of which was okay and the other I couldn’t even get through. I guess Death Code stands as the best of the bunch as it’s not just a rehash of the original (which would have been excruciating after JUST watching the original). In fact, Joshua, the computer program from the first film shows up as kind of a hero in this one, taking center stage for the last 10 or so minutes of the movie. This time, the story revolves around a kid named Will who plays an online game which is really a government trap to hunt down terrorists. I’m still not exactly sure how that works, but whatever, I bought it enough. This time he’s on the run with his lady friend and actually gets helped out by the scientist who created the program in the first movie. The only really interesting casting note is that Nicolas Wright plays his friend and Wright plays a guy named Davis on Accidentally On Purpose which was just on. Overall the acting is alright, the lines are all delivered well, but sometimes the reactions seem a little wooden. I would say that it’s not a necesarry movie to watch, but it’s fun enough if you want a thematic follow-up to the original flick.